In Warriors of Budo Episode Three Aikido we are able to answer many questions on pre-war martial arts or Budo in Japan. It was during man’s darkest period in history as war swept across the planet, that Japan’s most honored master of Budo, Morihei Ueshiba had a vision. He would follow a new path that would be called Aikido. “The only answer to aggression is love and harmony” he would say. In 1942 O’Sensei started building the Aiki shrine and outdoor dojo amid the farmlands of Iwama in the Ibaraki countryside. The practice of Aikido continues today with his grandson Moriteru Ueshiba who inherited the title of Doshu. At his morning class which begins at dawn, Doshu teaches Irimi-nage, bringing the founders concepts alive. As the attacker moves forward to strike, he is not stopped. Instead Doshu avoids conflict by entering to his side, and in turning to face the same direction they harmonize. “This is the harmony of Aikido” says Doshu, “becoming one with the opponent.”The late Gozo Shioda was the prodigy pupil of O’Sensei and in 1955 founded Yoshinkan Aikido and a new generation of Aikido masters. Chino Susumo and Ando Tsuneo are two of them. Chino sensei is head of the Yoshinkan Hombu dojo while Ando sensei left to open his own Aikido school. “Spirit is very important” says Ando sensei. “It is timing and cannot be late. It should invite the opponent and lead him in.” Episode Three of Warriors of Budo closes with a series of demonstration of these principles by Ando sensei and Jim Dawes, his uchideshi. 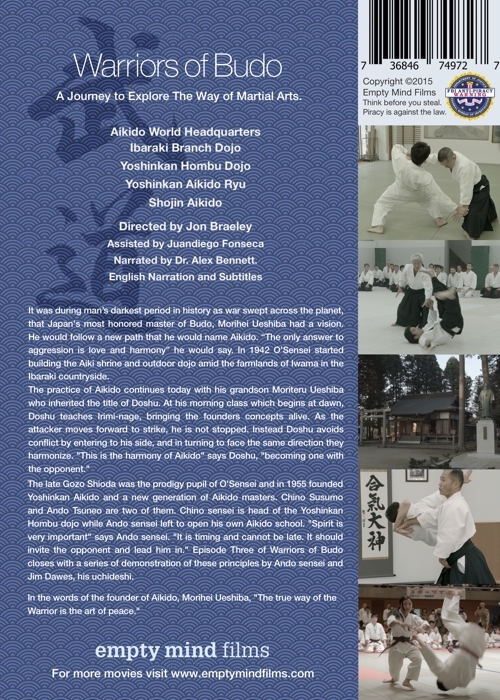 An exploration of Aikido through the words and actions of some of the top masters teaching today… Moriteru Ueshiba (Aikikai Foundation), Tsuneo Ando (Yoshinkan Aikido Ryu) and Susumu Chino (Yoshinkan Hombu Dojo). Hear from foreigners training in Japan as Uchideshi or ‘live-in apprentices’ who live and breathe Aikido everyday. 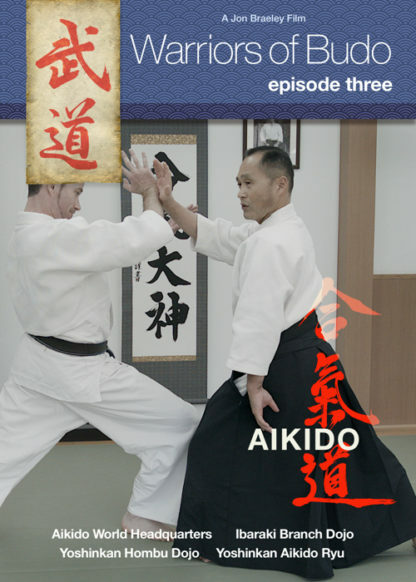 For the higher ranked Aikido-ka, watch and learn as the masters of Aikikai and Yoshinkan reveal their finest techniques with fascinating explanations that show us why Aikido is also a deadly martial art. 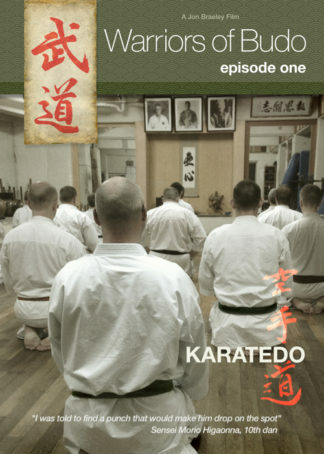 You may also be interested in Episode Four: Judo of our Warriors of Budo series. 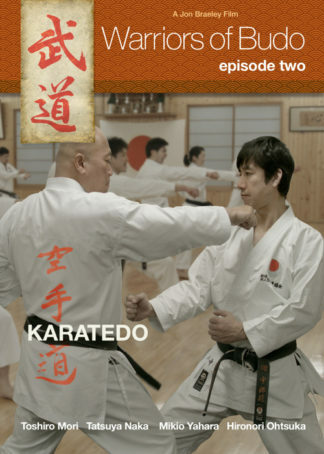 I have the Aikido Documentary and most of the others. Your work is outstanding and a great service to our broad martial art community. Thank you for all you do in your work for promoting Budo. Great DVD with really great content.